What constitutes great art? Is modern and abstract art simply a joke on the viewer? If anyone could grab a brush and splatter drops of paint on a canvas, does that make the work of Jackson Pollock less valid? 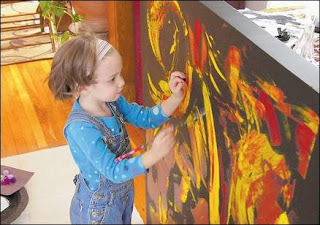 It’s a conversation I’ve had many times before with others and it’s one of the major questions that run throughout documentarian Amir Bar-Lev’s fascinating portrait of four year old Marla Olmstead who, a painter since she sat on her dining room table in diapers with a brush in her hand, became one of the world’s most popular abstract artists before she even set foot into preschool. Given Marla’s undeniable passion for painting, her loving dental assistant mother Laura and hobbyist painter/Frito-Lay employee father, Mark encouraged her in her efforts and were surprised when, after Marla’s work was on display in a local coffee shop, Marla garnered the admiration and support of local painter Anthony Brunelli who was so impressed by Marla that he staged a show for the artist in his gallery. A local journalist specializing in articles on kids and family covered the Olmsteads and after the local Binghamton, New York newspaper piece was picked up by The New York Times, a media feeding frenzy was born that went from adoration to suspicion and controversy when 60 Minutes planted a hidden camera inside the Olmstead’s residence that seemed to indicate that young Marla was being coached by her father. Were Marla’s works fraudulent? If they’re beautiful, does it really matter who paints them? Filmmaker Amir Bar-Lev was given unprecedented access to the Olmsteads for a year and it was about halfway through his documentary on the quiet, gifted young artist when media accusations were born and suddenly his film became something different altogether when there were enough scenes, conversations and arguments to have not only the average viewer but Bar-Lev who, by that point, had gotten very close to his subjects question the validity of the artwork and fingers began pointing in the direction of Mark Olmstead. Compelling and sharp with a modest running time of only eighty-three fast paced minutes, My Kid Could Paint That is the type of film you’ll want to discuss endlessly with friends but unlike most films about art, Bar-Lev is compassionate and earnest in never letting us forget that at the heart of the entire situation is an unquestionably lovable and creative little girl, who has been thrust into the spotlight at far too young of an age by not only the media but her family as well.